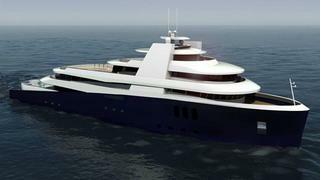 More news just in from Mark Duncan at Yachting Partners International as he gives me details of a new build project just signed with China’s Kingship Marine, a 75m expedition motor yacht called Arctic Whale. With an exterior and interior by French designer Eva Cadio, she will sleep 12 guests in six large, spacious cabins, all ensuite and all featuring the latest in audio visual entertainment systems, Arctic Whale uses all her space to maximum effect. Arctic Whale will be built with an ice-class hull and will be fully MCA LY2 compliant. She has a heli-pad (either ‘touch and go’ or fully functional), swimming pool, two Jacuzzis and an interior that can be fitted out to suit the owner’s own personal taste. The mechanical systems and engine package can also be specified by the owner.